I spend my Tuesday mornings intentionally engaging in conversations about God (among other things) with women who don’t share my views. Some think they believe what I believe about God, but their lifestyles communicate otherwise. Some don’t know what they believe. Some don’t really care to figure out what they believe. We spend thirty minutes one on one, talking out problems these women are facing. They tell me about themselves. I affirm their feelings. I try to make them feel heard and understood. I try to empower them to make well-educated decisions. I interject pertinent truth when it’s fitting. And, if I feel led, I share the Gospel proper. Thirty minutes is not a lot of time to get through all that. And I will never see the vast majority of these women ever again. It’s true, every unbeliever’s greatest need is an understanding and acceptance of the Gospel. And it’s also true that each unbeliever is at a different point along the path to accepting truth. If we think of a person’s journey to faith in Christ as a timeline, with their birth on the far left and their acceptance of Christ on the far right,we would do well to consider what happens in between. As they start traveling on their path, unbelievers go through stages. 1. Ignorance. The fact is none of us are born knowing the Gospel. We have to learn it. And whether we’re 4 or 94 the first time we hear it, we all spend part of our lives ignorant of the Gospel. 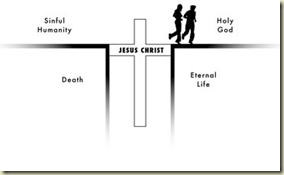 If unbelievers are in stage 1, I’m convinced the most loving thing we can do is share the Gospel with them. Lay it out, clearly, lovingly, with scriptural support. To withhold that information would be unloving and in direct violation of our charge as believers. But what do we do with unbelievers in stages 2, 3, and 4? They’ve heard the Gospel at some point, but they aren’t emotionally ready to accept it. In that case, sharing it with them again might actually turn them off. Is it in their best interest to share it with them anyway? Unless we really feel a definite leading from the Spirit to share, I’d say it isn’t. Christians ought to do whatever it takes to move non-Christians toward the Lord, and sometimes that means NOT sharing the Gospel verbally. If we sense they aren’t open to hearing the Gospel, although it sounds like an oxymoron, we can actually perpetuate their acceptance of the Gospel down the line by not verbally sharing it with them now. If an unbeliever has already heard the Gospel before and chose not to accept it, what they need more than anything – even more than an additional presentation of the Gospel – is a positive interaction with someone who calls themselves “Christian”. They need to feel respected, valued, appreciated, and accepted. An encounter like that will move them farther down the timeline toward accepting the Gospel for themselves much more readily than a pushy Christian with an agenda to verbally share the Gospel with every non-believer she comes into contact with. Totally agreed 🙂 As I explained to someone before, your actions and behaviors can speak much more to your testimony than launching into a diatribe about why they need to believe in Jesus. Especially if they’ve had a negative experience before with Christians, that is not going to open doors. Great insight. Fantastic observation. Everyone is not always ready to receive verbal witness. However they are always pleased to be treated with respect love kindness forgiveness and acceptance. That is part of our responsibility. We are not responsible to save others the Holy Spirit has that responsibility. Keep up the good work. Cool, I will check it out.